Dr. Tanya Golash-Boza, a sociologist, runs a great blog site, Get A Life, PhD, that is a goldmine of tips and resources to be a productive, successful scholar. On top of maintaining a healthy balance of her work, family, and personal lives, she also has multiple blogs (wow). Below, she has allowed me to share her most recent bit of advice on starting the semester off right. You may also other posts by Dr. Golash-Boza useful, including tips on teaching, effective writing, presentations, dissertating, health and wellness, public scholarship, productivity, and organization. How are you feeling about starting the semester? The end of summer usually involves a shift in the daily and weekly workflow for academics. During the summer, most of us have fewer commitments and many of us do not teach. Personally, I have always made a point to avoid the lure of extra income and not teach during the summer. As for administrative responsibilities, these accrue as one advances in one’s career. However, I try to keep those to a minimum during the summer months. Because of my research interests, I also usually spend nearly all of my summer outside the United States. This past summer, I traveled to Guatemala and Mexico – which also explains why I have not been posting to [my] blog all summer. This August, once again, I find myself looking towards the fall semester and thinking about how I am going to organize my time. My children start school on Monday, and I teach my first class on September 4. This gives me some time to get used to the rhythm before the semester starts in full force. During this time, I plan to try out a new schedule and see how it works for me. The idea is that I will create a weekly schedule that has my fixed appointments for the semester and also carves out time for things I need to do but could do at any time: prepare class, read, write, exercise, eat, and respond to emails. Kerry Ann Rockqeumore calls this schedule your “skeleton.” She suggests making one each week. Mine does not look like a skeleton at all, so I prefer to refer to it as a template. I find it useful to make a template at the beginning of the semester and setting up repeating appointments in your calendar so that your template is ready each week when you decide on your specific goals. When making my weekly template for the semester, the first thing I think about is teaching, as teaching has a fixed schedule and I need to set aside time to teach and to prepare for class. I am fortunate to only be teaching one class this semester. Thus, I block out the time I will teach as well as a few hours to read and prepare for class. I am teaching a graduate seminar and we will be reading a book each week. Thus, I need to set aside time to ensure I finish reading the book. I will have time to read for this class in the evenings, after the kids go to bed, but, from experience, I know I also have to set aside time during the day to read and think about the books before class. The next thing up is office hours. I have set those on Thursday afternoons. Up next is writing. I know I write best in the mornings. My children will leave the house by 8:30am each morning. And, my goal is to write for two hours each morning. From experience, I know I need to set aside two and a half hours in order to get in two hours of writing, so I will set aside 8:30am to 11:00am each morning. Once I do that, I remember that I need to be more efficient on Wednesdays when I teach, so I cut Wednesdays back to 10:30 and give myself some extra time to prepare class. I need to go up to campus on Wednesdays to teach and on Thursdays for office hours. I usually bike to campus, and it takes me about 45 minutes. So, I set aside an hour to get to campus on Wednesdays and Thursdays. 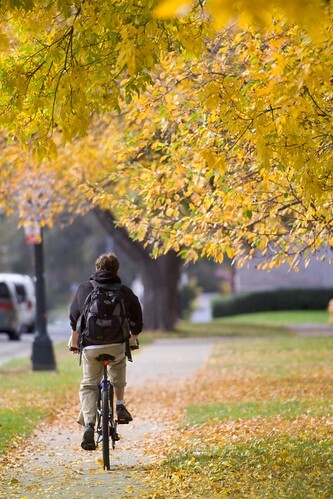 Biking to and from campus also counts as exercise for those two days. Once I do that, I remember that I often don’t finish all of my administrative tasks during office hours on Thursdays. So, I decide I should go to campus on Fridays as well and take care of business. I can use Friday afternoons to write reports, submit receipts, review materials, and clean out my email inbox. We all know how time-consuming email can be. So, I set aside another hour before lunch each day to take care of email. If I focus on email and avoid being sucked into the Internet vortex, this should be enough time. Then, I remember I also need to set aside some time to read. As I mentioned earlier, I do find time to read in the evenings. However, I also need time during the day to download articles, order books, and select what I will read. So, I decide to set aside Monday afternoons to select readings and to read for the week. I also need to get in my daily exercise. I will get in enough exercise from Wednesdays to Fridays by biking ten miles back and forth to work. So, on Mondays and Tuesdays, I set aside an hour for exercise each day. I color-coded my schedule so that I can see at a glance how much time I am dedicating to writing (red), admin (green), teaching (orange), and self-care (purple). As I make this schedule, I know from experience that probably no week will go exactly like this. However, it helps me to have a structure. It also is a reminder that I am very busy and have lots of things to do, even though I am only teaching one course. Inevitably, someone will ask to have a meeting with me during one of the times I have set aside for something else. That will be fine, though. Having this visualization of my ideal week will allow me to see what I need to move around in order to make time for a meeting. If I need to have a one-on-one meeting, my first suggestion will be that the person come to my office hours. If that does not work, I have also set aside time on Thursday and Friday afternoons to meet. If neither of those times work, I will move things around. For example, if I need to meet on Tuesday afternoon, I will have to spend some time on Monday preparing for class. Or, if we meet on Friday at 11, I will have to get an early start on my writing and pack my lunch to take to the office. If the meeting is casual, I can suggest we meet for lunch any day of the week. If I am asked to join a group meeting, I will suggest that the meeting happen on Thursday or Friday afternoon. My next preferred time will be a different afternoon. As usual, I will do my best not to schedule meetings during my writing time, as I know from experience that mornings are my most productive times for writing. What about you? What will your ideal week look like? Do you find making this kind of schedule helpful? This entry was posted in Health and Self-Care, Research and Writing and tagged Tanya Golash-Boza, time. Bookmark the permalink.